Obtained from several of our reliable vendors, the offered Industrial Telephone with Built-in Page Amplifier is considered to be one of the finest that is available. These product is highly regarded for its unparalleled features and durability. We are among the acclaimed names in the industry for manufacturing and trading Industrial telephone with built in Page Amplifier. The offered product has been made in sophisticated manufacturing unit and is latest in technology. 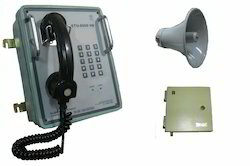 It consists of EPABX unit and field industrial telephones for reaching out to maximum number of stations. The field industrial telephone is equipped with high quality amplifiers for uninterrupted functioning of public addressing system. This system consists of an Epabx unit located in the control room. All the field industrial telephones have built-in page amplifier. These are connected to the EPABX unit. 230 V AC power supply is extended to the EPABX unit. The field operator lifts the handset and dials the required extension number. The page circuit in the field call station senses the incoming call and shifts the line to page amplifier board. The ring back stops and the calling party makes the paging announcement through his telephone. This announcement is amplified in the particular field call station FCS and heard through the page loudspeaker connected to it. If the called person picks up the FCS handset while the announcement is in progress, then the calling and called persons get connected for conversation in pvt. Mode. In case the calling person disconnects the line after making the page announcement, the called person can dial the no. of the earlier caller from any FCS, make a page announcement and proceed to talk to him. 3). Make all – zone announcement. Looking for Industrial Telephone with Built-in Page Amplifier ?